Garmin Montana 650 680 610 600 CASE made in the USA by GizzMoVest LLC. Camo w/ Cord Loop, Belt Clip & Lanyard w/Clip. Garmin MONTANA 650 650 680 610 600 Carry CASE MADE IN THE USA by GizzMoVest LLC. A Lightweight, Military-grade semi-rigid, All-molded Carrying Case for the Garmin Montana featuring a molded thick protective skin made from a composite of a shock absorbing foam. Impervious to water. Versatile 6-hole Cord Loop system (through which a belt or pack strap can be threaded) allows many mounting possibilities for the Garmin Montana. Montana Unit can be activated/deactivated through the Case by sliding slider up slightly, then depress the Zipper Staple. When fully closed, the slider prevents activation. Backed by the manufacturer's 3-Yr. Warranty against defects and workmanship. Please search Amazon for other colors. 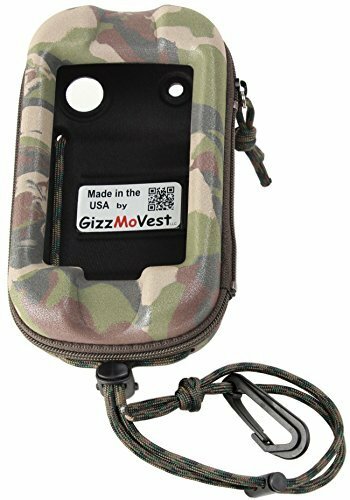 Garmin MONTANA 650 680 610 600 CASE MADE IN THE USA by GizzMoVest LLC. Custom-Molded in a tough camouflage high-density foam (impervious to water) adds shock protection and a tactile grip for your Garmin Montana. Versatile 6-hole Cord Loop system AND Belt Clip allows securing the Garmin Montana to your belt or pack-strap. Adjustable Wrist Lanyard and Safety Clip included. Deeply-recessed screen opening maximizes protection for your Garmin Montana. Compatible with our Belt Clip Accessories. Rugged, yet lightweight - 2.8oz. Garmin Montana 650t 650 600 Montana Case, Heavy-Duty in Black with Cord Loop & Lanyard with Clip.